Telly illusionist Derren Brown is planning his most mind-blowing trick — turning a straight man GAY. The hypnotist also thinks he can use his powers to make a gay man fancy women. 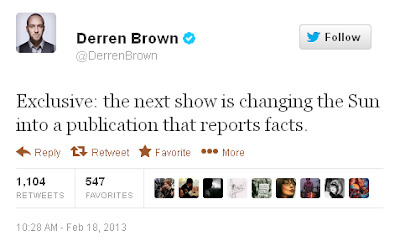 He hopes his latest stunt will be as big a hit with viewers as last year’s Derren Brown: Apocalypse. A British tourist told yesterday of his flight of terror when he claims an emergency exit on a super jumbo blew open at 27,000ft. The comments under the story are extremely revealing as the vast majority debunk claims made in the article. Door indicator shows green for open instead of red for closed. But this is wrong for two reasons. A green light on a door indicator would indicate the door is closed - after all, an open door would be the dangerous thing, and danger is usually highlighted with red. that light actually means there is a passenger call bell or a phone call to that doors inter phone. Ok speaking as an A380 pilot, I have to say this article is almost laughable in almost every sense. 1) The picture showing the "door indicator" is actually the passenger call indicator indicating that someone was obviously so bothered by this that they wanted a Gin and Tonic. 2) If a door had "blown" as the article had suggested, do you think with an approximate pressure differential between inside and outside of 8.5 PSI that a blanket would stop everyone from being sucked out? 3) I would love to know how you can hide under an A380 jumpseat, there is barely enough room to keep a lifejacket there. 4) There is no curtain between Economy and Business class, they are separated by....... a floor. This was nothing more than a leaky seal in a door and the blankets were for passenger comfort on a short (2.5 hour flight). I think Mr Reid needs a groundschool refresher of basic physics and leaves the operating of these multi-million pound aircraft to the professionals. But, as many of the comments point out, it would be very odd if air 'blasted in' at 27,000ft. And if the cabin pressure 'plunged' the oxygen masks would have deployed, yet this is not mentioned anywhere in the article. 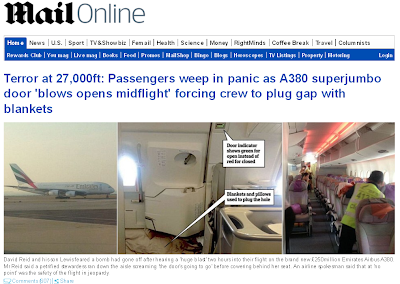 It seems odd, too, that none of the other passengers - who were apparently 'weeping in panic' - seems to have come forward to support the claims made in this Mail article. It seems accuracy has lost out to numbers of visitors as the most important thing about this story as far as MailOnline is concerned. 'At no time during the flight did one of the upper deck doors open. There was also no loss in cabin pressurisation at any time during the flight. 'The noise from the door was caused by a small dimensional difference between the inflated door seal and the door lower frame striker plate, when the door is in the closed position. This is currently under investigation in conjunction with Airbus. Emirates have now fixed the problem. Despite this latest update, the rest of the article - including the photos claiming the green light shows the door is 'open' - remains uncorrected. A recent column said that EU regulations prevent the Women’s Institute from selling jam in re-used jars. In fact the rules apply only to commercial food businesses. The 'recent column' was written by Richard Littlejohn and was mentioned on this blog on Tuesday. This correction was published (at time of writing) ten hours ago on the Mail's website. But they haven't bothered to edit the original column - the incorrect claim remains there, and this correction hasn't been added to article. It doesn't appear anywhere on today's Littlejohn column either, so his regular readers may not even realise this has been corrected. Moreover, the original news article, which made the same false claims back in October, remains live on their website and has never been removed or edited or corrected. In the circumstances, it might make sense if they acted in some way over the original and then apologised for giving their readers the same, untrue information twice. 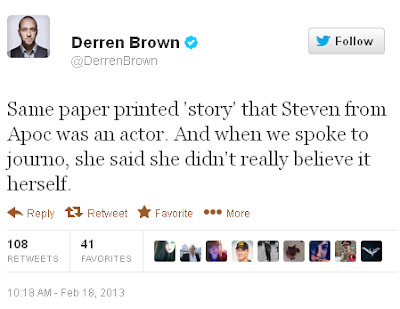 The first photo on the article was of the actress holding the ultrasound picture. There was then a close-up of the image of the unborn child. She clutched the black and white photograph in one hand while strolling down the street with a friend. MailOnline - named Newspaper Website of the Year at last year's Press Awards - has now removed the article. Funny how the EU can enforce strict food hygiene regulations which prevent the Women’s Institute selling jam in second-hand jars but can’t stop Eastern European horsemeat being passed off as beef. completely untrue. There are no EU laws, new or old, which ban re-using old jam jars for fetes. Therefore, the Commission can confirm that, as long as the preparation, handling and selling of jams at local events to raise money for worthy causes is an occasional activity, it is not covered by Regulation (EC) No 852/2004. Rules governing such activities are established by Member States under national law. Legislation is predominantly aimed at food businesses and excludes occasional activity with respect to charities; therefore the recent interest does not apply to infrequent charitable activities. Despite all this, Littlejohn claims not only that there are 'strict' regulations banning the WI selling jam in re-used jars, but that the EU are 'enforcing' them. Salt is safe to eat – and cutting our daily intake does nothing to lower the risk of suffering from heart disease, research shows. 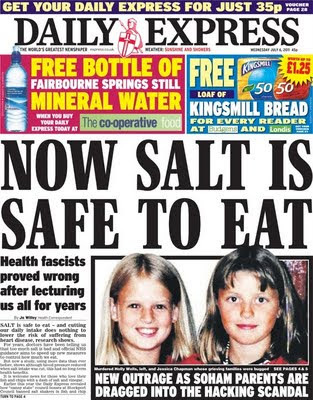 For years, doctors have been telling us that too much salt is bad and official NHS guidance aims to speed up new measures to control how much we eat. But now a study, using more data than ever before, shows although blood pressure reduced when salt intake was cut, this had no long-term health benefits. And anyone who says different is a 'health fascist'. Reducing the amount of salt we eat could save 25,000 lives a year, health experts said last night. Deaths from heart disease and strokes would dramatically fall if shoppers checked the ingredients of everyday foods like bread and cereals. Doctors blame the high levels of salt-laden processed foods we eat for pushing up blood pressure levels, raising the risk of heart disease. Articles of 7 and 14 May 2012 said that the Duke of York had demanded a private plane, travelled in a chauffeur-driven Rolls-Royce and snubbed free accommodation for his official Diamond Jubilee visit to India. We now accept that the Duke had no personal involvement in the decision to charter the plane, did not travel in a Rolls, and that the British High Commissioner’s residence was deemed too small for his party on this occasion. We apologise to the Duke of York for the misunderstanding. In a story headlined "Lad of 12 leader of Cornish liberators" (Oct 23) we stated that Cornish extremists had recruited a 12-year-old boy to run a division of their "liberation army". We are happy to clarify that the Mid Cornwall Liberation Army, an outdoors adventure group run by the boy and his friends, has nothing to do with the militant Cornish National Liberation Army. Every medal won by the British Swimming team at the London Olympics cost a grand total of £8.4million each. Did you know that Britain's swimming team are controlled by a chief executive living in Germany and a performance director based in Australia? It's true. CEO David Sparkes and coaching supremo Michael Scott pop in and out of the country from their overseas homes. Brussels was...proposing to take control of Britain’s seabed. It is not about the transfer of powers to the EU, or seizure of sovereignty over the UK’s seabed, or the rights to minerals, such as oil or gas. Nor is it about controlling the fish above the seabed. The Myth: The Daily Express has reported that one of the amendments being debated by the European Parliament on the reform of the Common Fisheries Policy would allow the EU to seize control of Britain’s seabed. The piece claimed that critics have said that if passed the amendment could lead to the EU claiming rights to minerals such as oil and gas. The Truth: This is not true. Even if agreed by the European Parliament, this amendment would not change the sovereignty of our sea bed or give the EU new powers. The proposed amendment would have no practical effect, nor would it have any bearing on mineral extraction. The reform of the Common Fisheries Policy is intended to stop overfishing, boost fish stocks and improve the health of our seas. The UK does not support this amendment as it will not help to tackle the fundamental failings of the Common Fisheries Policy. In October 2012, many column inches were devoted to claims that Brighton and Hove City Council was planning to 'scrap' the terms Mr and Mrs. There were many other websites that repeated the same claims. But the story wasn't correct - the Council had not made any recommendations or published any plans at this time. The Council's Trans Equality Scrutiny Panel, who were looking into a range of issues, suggested there was a problem with a set-list of honorifics on online forms - that if you don't select one of the set options, and some trans people do not feel that the titles Mr or Mrs are suitable for them, it could prevent completion of the form. So people could still call themselves Mr or Mrs, but they would have the freedom to choose a title with which they felt most comfortable. They don't identify as male or female, prefer "Mx" (pronounced "Mix") as title of choice, and feel positively excluded by forms that demand they pick from a limited list of gender-specific titles. It's a small exclusion, but why should they have to put up with such when a remedy is so easily implemented? Given recent press coverage of the subject of honorifics, the Panel would like to make clear that they never had any intention of recommending that the use of honorifics should be removed. The recommendation of this report is aimed at giving more choice to those who do not want to identify as Mr/Ms/Mrs/Dr. It is worth noting that this may not just apply to trans people: others may not choose to use a honorific if given the option. Recommendation 35: The Panel welcome the addition of the honorific Mx by council benefits staff as giving an alternative option. The Panel recommend that all on-line forms are examined to look at the possibility of additional options, leaving blank or entering the title the individual feels is appropriate to them. Three weeks on, and neither the Sun, Mirror, Mail nor Telegraph appear to have informed their readers of what has actually been recommended by the Panel. A search of all four websites using terms 'brighton mx' and 'brighton trans' reveals no new articles on this subject since October. We acknowledge and regret that the tone and content of much of the on-line debate over the last week has caused distress and may have damaged the trust we have sought to build up. We condemn the offensive and discriminatory tone of much of that comment, and reiterate that all members of the panel remain committed to transgender equality. We also recognise the need for balanced, fair and accurate media reporting and will be working proactively to encourage this regarding the scrutiny going forward. How strange that York appears to have Christmas decorations up in early February. They don't, of course. It's just that the MailOnline has included an old photo - one that was taken on 1 December 2010. York only had the lightest sprinkling of snow overnight, all of which had gone by mid morning. 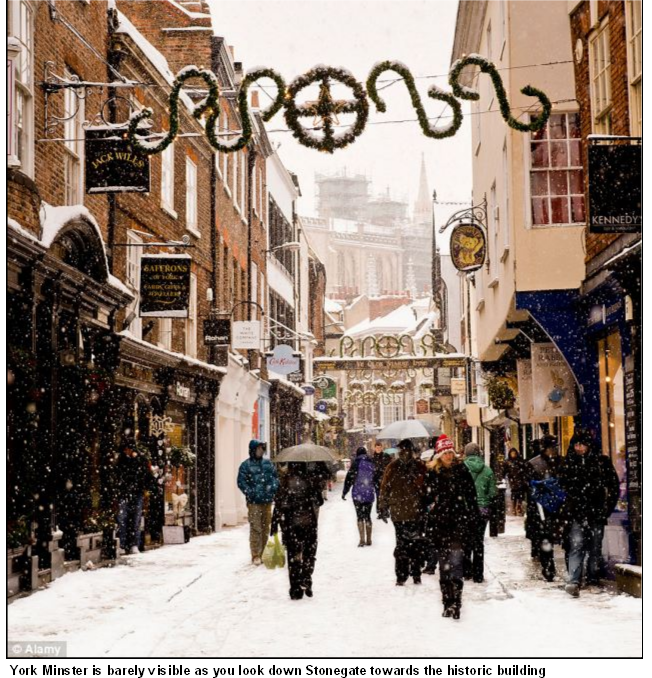 The Express was caught out last month using an old snow scene photo and claiming it was new. Labels: fake images, mail, what's wrong with this picture? In early January, the Daily Mail was trying to create another Sachsgate-style outrage, this time about Big Fat Quiz of the Year. It got very upset about some jokes on the post-watershed Channel 4 comedy show, and was desperately trying to get its readers to complain to Ofcom. Ofcom is understood to have received just a single complaint on the day the show was broadcast on Sunday 30 December, and just five more the following day. However, after a series of Daily Mail front-page stories and the paper reprinting jokes from the programme in full on page 4 on Wednesday 2 January, complaints to Ofcom increased to 180. An Ofcom spokesman said: "After careful consideration, Ofcom has taken the decision not to investigate this issue. In reaching this decision, we concluded that the programme was scheduled post watershed; it was preceded with a clear warning of 'strong language and adult humour'; and was consistent with audience expectations of a satirical quiz on Channel 4." The Mail claimed the verdict 'shocked MPs and campaigners'. A top banking executive has won a high court apology and £60,000 in libel damages plus £690,000 in costs from the Mail on Sunday, over articles that falsely implied he was at the heart of a criminal mortgage fraud. Irfan Qadir, a former Bank of Scotland director, sued over libels in two Mail on Sunday articles in May and June 2011. An article ‘Bank of Scotland director “drove us out with dogs’’’ on May 8, 2011, reported allegations in a writ that in 2005, Irfan Qadir committed perjury and intimidated three businessmen, causing fear for their own and their families’ lives, to gain control of a nightclub. The article did not report Mr Qadir’s denial of the claims and wrongly alleged that he had declined to comment. A further article, ‘Top banker named in mortgage fraud case’ on June 19, 2011, reported an allegation in a separate case that Mr Qadir centred in a £49million bank fraud. In fact, the judge in that case made it clear this was unsupported by evidence in the five-month trial, stating that Mr Qadir did not lend any money and the allegations in court should not have been made. We are no longer pursuing a defence that the allegations in the articles are true. We apologise to Mr Qadir for the distress and embarrassment caused and are paying substantial damages and legal costs. The headline to an article last Sunday about a tragic road accident may have implied that Ben Brooks-Dutton had some element of choice about saving either his wife or son. We would like to clarify that there was no such choice and we apologise for any contrary suggestion.